All three railways run from an Atlantic port eastwards into the interior, but the two CFA lines are isolated from other railways. The CFB joins up at Dilolo with the Chemin de Fer du Bas-Congo au Katanga (BCK) and is thus connected with the vast railway system of Central and Southern Africa. In addition to these 3ft 6in gauge lines, there is a selection of narrow gauge light railways and this article is concerned with some of the 60cm gauge examples. Prior to my visit to Angola in June 1965, I had been able to obtain only scant information about the narrow gauge railways that were alleged to exist. Such entries in the Club’s Overseas Records as "The Engineering Company of Portugal, Amboim - Bagnall 2−8−2 side tanks 2637 and 2638 of 1940" merely pointed the way and that was about all. ‚ However, soon after my arrival in Luanda, I established that a branch leaving the CFA Luanda - Malange line, at a point some 208km from Luanda, was indeed narrow gauge. So off I went on the Wednesday 06.00 train for Canhoca on a voyage of discovery. I was not to be disappointed as here was an active 60cm gauge railway set in delightful surroundings. The northern side of Canhoca station comprises a platform for the 60cm train, together with sidings and a triangle for turning the locomotives. An 0−8−0 side tank and an 0−8−2 side tank were busy shunting and a further 0−8−2 side tank stood in the open, adjacent to the 3ft 6in gauge shed. Soon it was time to join the twice-weekly mixed train for Golungo Alto, which comprised two composite coaches (painted a brilliant carmine) plus one covered van. In addition, the locomotive was provided with a ‘tender’ in the shape of the front half of a bogie vehicle which was crammed high with wood. The rear half of this vehicle served as a baggage van and also contained a ‘W.C.’ for the use of all and sundry! All the rolling stock and locomotives were built by Orenstein & Koppel during the 1922-1925 period. The line climbs 511 metres on its journey of 31km up to Golungo Alto. A couple of stops were made in the middle of nowhere before we reached Cambondo (14km), where the little engine drank long and hard. I felt envious, but a local character came to the rescue with green tangerines which tasted surprisingly ripe. The next station had to be my destination as I needed to return to Luanda that evening. So we came to Quitongo (19km), and I watched the picturesque train pull away and slowly disappear through the dense foliage. This train doesn’t belong to Africa, I thought to myself. It’s too Germanic - a sort of Jungle Feldbahn! An eerie silence now fell on this clearing in the jungle. Occasionally a brightly coloured bird flitted between the trees. Coconut palms stood aloof and the banana trees were plentiful. As I sat on the rail to await the Canhoca-bound ‘automóvel de linha’, the outside world seemed very remote. Faint noises at first, and then a clearly audible siren announced the approach of "AL 11", a Perkins-engines Wickham railcar, which I managed to halt at my outpost. The railcar runs a daily return trip from Golungo Alto, primarily for mail. Being the only passenger, I joined the driver for the journey down the winding slopes. Canhoca and its surrounding green hills soon came into view, and after sounding the ‘factory hooter’ for a few wayward natives, we drew up at the platform in good time for the Luanda railcar. With four steam locomotives (a further 0−8−0 side tank was said to be away at works), the Golungo Alto branch cannot be described as a busy line. Besides the twice-weekly ‘misto’ in each direction, there are no doubt a few extra trains in the coconut, banana and citrus seasons to carry the produce on its way to civilisation. After Luanda, my next point of call was the small port of Amboim, some 200km to the south, which is served by the Luanda - Lobito air service. As the next ’plane onwards to Lobito was three days later, I had ample time to explore the 60cm gauge Caminho de Ferro do Amboim (CFA) which runs from Porto Amboim inland to Gabela (123km). The hinterland is an important coffee-growing region, and it was to serve the plantations that the railway was originally constructed in 1923. There is a small jetty at Amboim whereby cargo is transhipped by lighters to and from ocean vessels anchored off−shore. Other than a small fish factory, this is Porto Amboim! Unfortunately, I had picked the wrong half of the week for the weekly return mixed train to Gabela, for which one of the Bagnall 2−8−2 side tanks is normally used. There are also three return trips per week by Wickham railcar, but the return fare of 196 escudos was prohibitive, and a high price to pay for 16 hours in a mobile chicken-hutch! The line climbs 1049 metres en route to Gabela and apparently there are sidings serving the coffee fazendas. The coffee-picking season is in August, at which time four steam locomotives may be used daily. For the remainder of the year goods traffic is light, although the peace of my first evening in Porto Amboim was shattered by the deep whistle of a Henschel 2−6−0 side tank on an incoming train. During the rest of my sojourn, no steam locomotive moved but native fitters were ‘doing things’ to the motions in preparation for the coffee season. Statistics for 1963 gave passengers carried as 10,775 and merchandise as 31,717 tons, of which nearly 50 per cent was coffee. 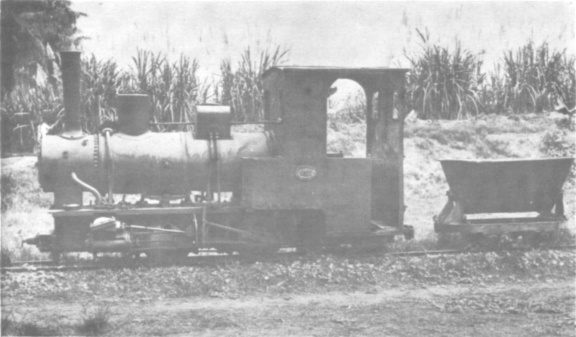 Krauss 0-4-0WT No,1 at Catumbela Sugar Factory. 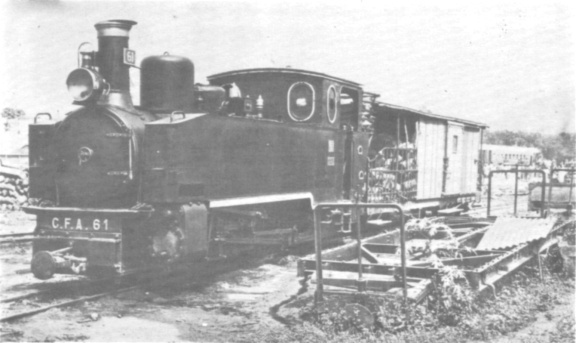 Orenstein & Koppel 0-8-2T No.61 at Canhoca. Notice the ‘tender’. The active rolling stock of the CFA consists of seven steam locomotives and two diesels for shunting the yard and jetty. Additionally there are the remains of several locomotives which were used on the construction of the railway. The steam engines are wood-burning, the fuel originating from forests some way up the line, and tenders are provided for the wood and supplementary water supply. There are three petrol railcars, of which two were supplied by Wickham in 1942 (capacity eight passengers). The third came from the "Casa Draisinenbau" in 1952, being powered by a four-cylinder Ford engine, and has a capacity of three passengers. The railways latest acquisition is a diesel-powered Wickham, supplied in 1960, with a capacity of fourteen passengers plus 1,000 kilos of cargo; it is painted green and named BOA VIAGEM. Two 3rd class vehicles and a composite 1st/2nd make up the scarlet-painted passenger stock. 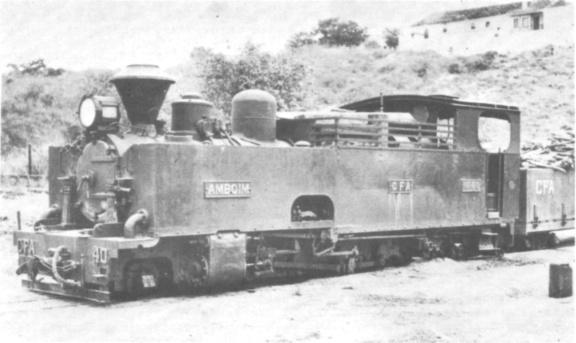 Most of the seventy-four wagons and four brakevans were lying around the sidings at Porto Amboim and a full list was obtained over the three days. The passenger coaches and earlier wagons bore Robert Hudson plates, but later wagons appear to have been constructed locally. Saturday in Porto Amboim brought the weekly film. This was an Italian production with French dialogue and Portuguese sub-titles, featuring of all places the Caribbean! Appropriately, it included some scenes of a narrow gauge American locomotive working in one of the sugar plantations. Should you ever be in Porto Amboim, try and make it on a Tuesday. For then you can sample the 94−hour journey to Gabela behind a Bagnall 2−8−2 tank. 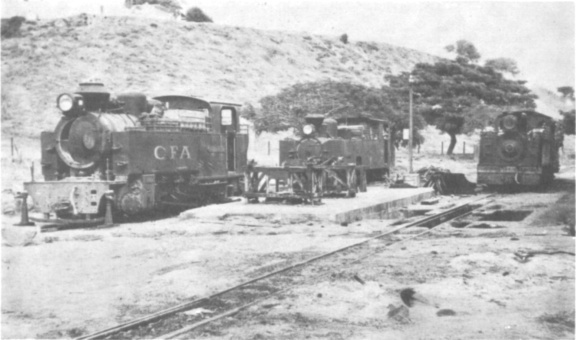 * derelict locos used on construction of the railway. Baldwin 46262 was originally U.S. Army 5007.
what appear to have been eight-coupled locomotives. My third and last encounter with the 60cm gauge in Angola started with a chance glimpse of a German well tank locomotive from a local CFB train on the coastal plain between Lobito and Benguela. I managed to return and inspect the rolling stock of the Sociedad Agricola Cassequel Limitada who own a sugar mill at Catumbela. The plantation railways are now operated entirely by a mixed bag of German and American diesels but the two original Krauss steam locomotives are preserved in a primitive open air museum. For the agricultural steam enthusiast, this ‘museum’ contained two magnificent Fowler ploughing engines. Bagnall 2-8-2T No.40 AMBOIM at Porto Amboim shed. No.60 (Henschel), No.40 (Bagnall) and No.22 (Henschel). For the intrepid, there is still scope for further narrow gauge investigation in Angola. What do the CFA(M) use on the 60cm gauge 124km branch from Sá da Bandeira to Vila de Almoster? What works on the 28km Cuio sugar railway owned by the Companhia do Assucar de Angola? And does the railway still exist on the equatorial isle of São Tomé? Well, I‘ve just about talked myself into paying a return trip!